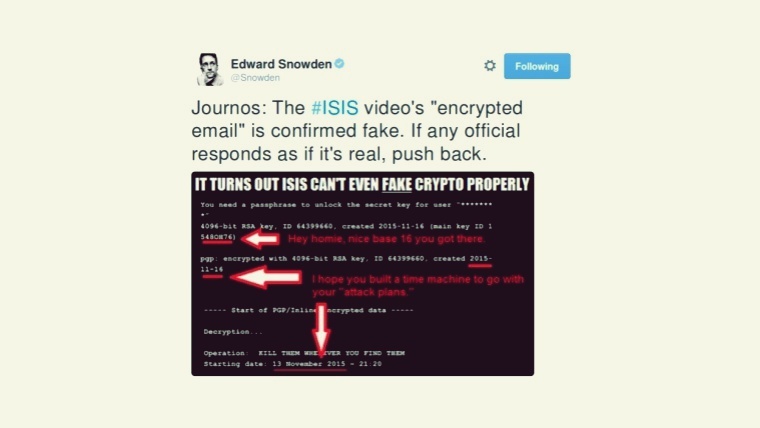 Islamic State Releases Video Depicting Gunmen Involved in Paris Attacks — However, Snowden exposed how the video is fake. The video shows nine suspected terrorists prior to carrying out the attacks in Paris on Friday, November 13th, 2015. Some of the terrorists are shown to be beheading prisoners and participating in military training somewhere in the Middle East. The locations, which were targeted during the attacks on French capital, are also shown in the video. It must be noted that during the Paris attacks, more than 130 people were shot dead by armed terrorists supposedly part of the notorious extremist militant organization ISIS (Daesh). In the end, the video shows images of United Kingdom MPs facilitating air strikes in Syria, against ISIS. This particular footage was released by Islamic State’s media channel. According to President Francois Hollande, videos like this cannot stop France from thwarting terrorism and that the attack, though planned in Syria, was actually prepared and organized in Belgium. This video was filmed in the de facto capital of ISIS, Raqqa, probably before the Paris attacks actually occurred. The Mirror Online has edited excerpts of the video with the disturbing scenes removed. It is yet unclear why the video has been released now when more than two months have passed after the attacks. Snowden highlighted the fact that the key ID 1548OH76 isn’t hexadecimal yet, if we replace the “O” with a “0” (zero), then it would rectify that but still the “H” would remain a problem. He also pointed out that the PGP key utilized for decrypting the other messages from the organization, probably for giving instructions for the attacks, was developed post the attacks. However, this could mean that for encrypting the decrypted Paris instructions ISIS doesn’t utilize the original PGP key but a later one. But the main question is, why now and most importantly what message does the video need to convey. Should it be taken as the warning of a similar, large-scale attack on a high-profile location in the near future? Or, is it just a test to check whether the intelligence agencies can decipher the real message? Is it a taunt, trick or a provocative measure? The video’s encrypted message, regardless of what it tries to convey, perfectly shows the reason why banning or breaking crypto will be productive. Making strong crypto illegal is not going to deter suicide bombers from using it but it will certainly weaken the privacy and security of many law-abiding citizens.